Rules of David Brown Hnefatafl 11x11 (unarmed king). Same rules as Sea battle tafl 9x9, except that the board is size 11x11 and has a throne square. NB. The David Brown throne square is friendly, i.e. the square does not participate in killing normal pieces. But it can participate in capturing the king, when the king is surrounded by three enemy pieces on three sides and the throne square on the fourth side. The David Brown rule #9: "If the attackers surround the king and ALL remaining defenders, then they win, as they have prevented the king from escaping. the attackers win by encircling all defenders." This is a paraphrase of the rules that were supplied with the version of Hnefatafl published by the York Archaeological Trust in 1980. The game was developed by David Brown of Oxbow Games, Oxford, in association with the Trust. 1. The game is played by two, one taking the part of the king and his twelve dark defenders, the other taking the part of the 24 fair attackers. 2. The game begins with the pieces set out on the marked squares as shown in the picture. 3. To win, the attackers must prevent the king from escaping the board by boxing him in on all four sides, so that it cannot move. 4. The defenders win by moving the king to the edge of the board. 5. The attackers move first. 6. All pieces move along a rank or file as far as their players desire, as long as they do not land on or jump over squares occupied by other pieces. 7. No piece other than the king may land in the central square. 8. Pieces other than the king are captured by surrounding them on two opposite sides along a rank or file. The king is captured by surrounding him on four sides, as described above. 9. If the attackers surround the king and ALL remaining defenders, then they win, as they have prevented the king from escaping. 10. If the king is surrounded by three attackers and a defender occupies his fourth side, the defender can be captured by sandwiching it between the king and an attacker. 11. 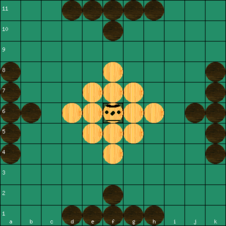 If the king is surrounded by three attackers and the central square is on his fourth side, then he is considered fully surrounded and loses the game. The leaflet also contains rules for changing the balance of the game if the players desire it. a. The king can be allowed to take part in captures, or possibly to capture only when making the attacking move. b. The king can be awarded victory only on reaching a corner. If this is the case, the corner should be inaccessible to pieces other than the king, and an attacker (only) beside a corner square can be captured against it by a single defender on the opposite side. c. A 5-point match can be played; the attacker places four cards A, 2, 3, 4 face down one by each edge of the board. The defender wins the number of points on the card by the side on which the king exits. This introduces a form of bluffing to the game. d. Play two games, swapping sides. On a tie break, judge the winner of the contest by the number of moves or by the number of pieces captured. More about the David Brown Hnefatafl in our forum. Rules published by David Brown 1980. A game with these rules was produced by Oxbow Games, Oxford in association with York Archaeological Trust, see more about this at Damian Walker's.